Think oatmeal has to be boring? These healthy recipes will make you think again…and sing this grain’s praises! Breakfast doesn’t get more boring than a package of quick-cooking oatmeal. It turns to flavorless mush in minutes and is never quite filling enough. But that doesn’t mean you have to count oatmeal out of your meal plan. Upgrade steel-cut oats by preparing them from scratch with fresh fruit, seeds, nuts, and even your favorite protein powder. And don’t worry about the work! It’s as easy as mixing up some ingredients and turning on the oven or Crock-Pot. If hot oatmeal just isn’t your thing, you can also try oat risotto, oatmeal bars, oaf-flecked waffles, and overnight chilled oatmeal – perfect to try on a balmy summer morning. Risotto is a blank canvas for flavors – garlic, white wine, leek, and fresh basil – but you can also play with the base ingredient. 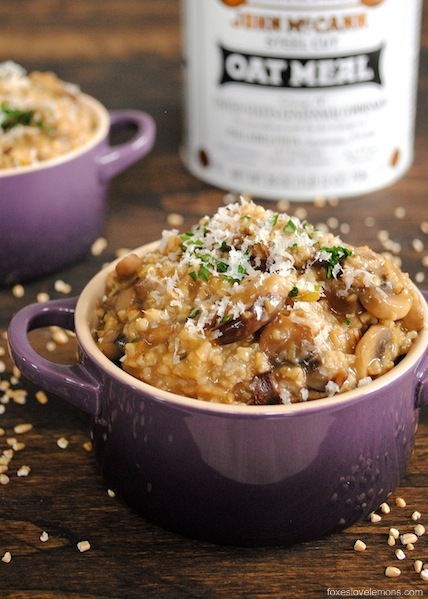 Instead of Arborio rice, try steel-cut oats. For more inventive recipes that will up your nutritional intake, pick up The Plant-Powered Diet: The Lifelong Eating Plan for Achieving Optimal Health by Sharon Palmer, a dietician who is committed to helping more people fill their plates with whole foods. 1. Heat the olive oil in a large saucepan. Add the squash, leeks, mushrooms, garlic, and black pepper and sauté for 3 minutes. 2. Meanwhile, heat the broth and wine in a small saucepan over medium heat until warm but not boiling. 3. Stir the oats and walnuts into the vegetable mixture. Ladle approximately 1/2 cup of the warm broth mixture over the mixture. Cook over medium heat, stirring constantly, until the liquid is absorbed. 4. Add another 1/2 cup broth mixture and continue cooking, stirring, and adding more warm broth until all the broth has been incorporated and the risotto is creamy and just tender, about 20 minutes. 5. Stir in the fresh basil, and serve immediately. 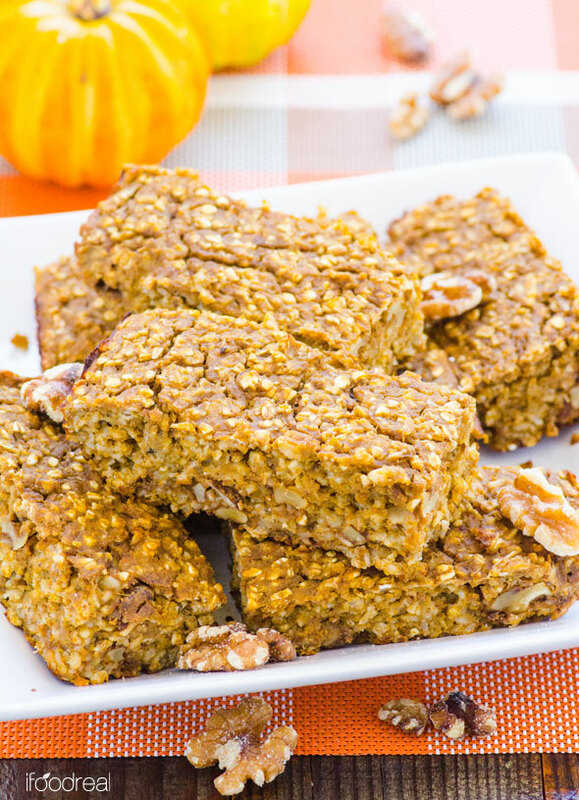 Whether you need breakfast, a snack, or a healthy dessert bar, these have all the decadent pumpkin flavor to enjoy it plus the nutritional profile to feel great about it. Don’t be intimidated by the baking with this bar, either. All you need is a single mixing bowl, a spoon, and a square dish to put these together in your home kitchen. 1. Preheat the oven to 375°F. Line an 8” x 8” square baking dish with parchment paper, and spray with cooking spray. Set aside. 2. In a medium bowl, whisk together pumpkin puree, applesauce, egg whites, maple syrup, vanilla extract, pumpkin pie spice, baking powder, baking soda, and protein powder. Add oats and walnuts. Stir well. 3. Pour mixture in the prepared baking dish, level with a spatula, and bake for 35 minutes. The bars are finished with a toothpick inserted in the center comes out clean. 4. Remove from the oven, let cool for 10 minutes, and transfer to a cooling rack for another half hour. Use a serrated knife to cut into 8 bars. 5. Serve warm or cold. Refrigerate in an airtight container for up to 1 week, or freeze for up to 3 months. Love cobbler? Then you’ll want to dig into this baked oatmeal. The recipe calls for bananas, but go ahead and substitute any fruit that you love warmed up with the natural sugars caramelized. Try apples, pears, peaches, plums, or apricots. All of them will be delicious with the maple syrup, but honey is just as tasty if it’s what on hand. 1. Adjust oven rack to middle position, and preheat to 350°F. Lightly grease 2-quart shallow baking dish with butter. 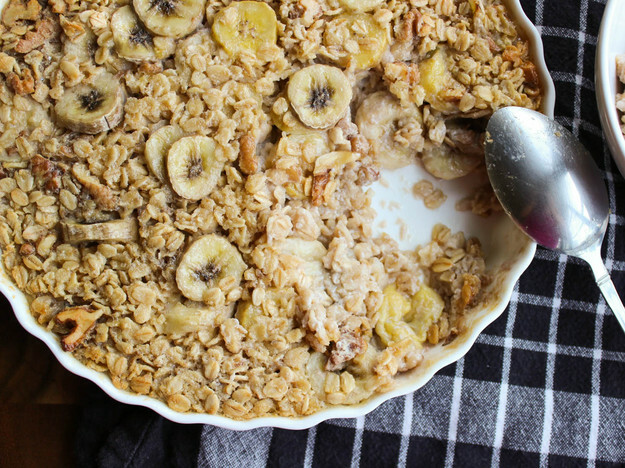 Scatter oats, walnuts, and bananas into baking dish. 2. Whisk 1/3 cup maple syrup, salt, cinnamon, egg, milk, and melted butter in a medium bowl until combined. Pour into baking dish. Using a spoon, gently press oat mixture into liquid to moisten evenly. 3. Scatter brown sugar over the top and bake until center is just set, about 30 minutes. Serve immediately, drizzling extra maple syrup over the top to adjust sweetness. Oats are heart healthy due to omega-3 fatty acids, folate, and potassium. And because oatmeal is high in fiber, particularly steel-cut and old-fashioned varieties, this superfood is able to lower levels of LDL cholesterol. 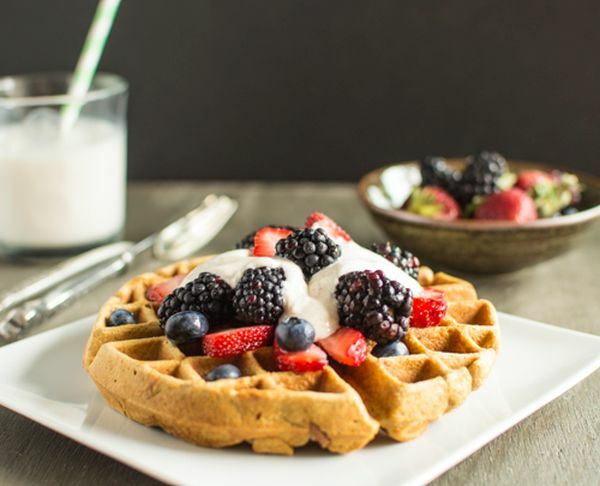 In lots of recipes that start with flour, including breakfast staples pancakes and waffles, and you can sub in some whole oats for more whole grains. 1. In a large bowl, mix eggs and buttermilk together. Add the oats, and mix well. Stir in honey, vanilla, and oil. 2. In a separate bowl, combine flour, salt, baking soda, baking powder, and cinnamon. Stir into the egg mixture, and thin with milk to reach the desired texture. Gently fold in blueberries. 3. Pour about 3/4 cup batter onto a greased, preheated waffle maker. Cook according to manufacturer’s directions. 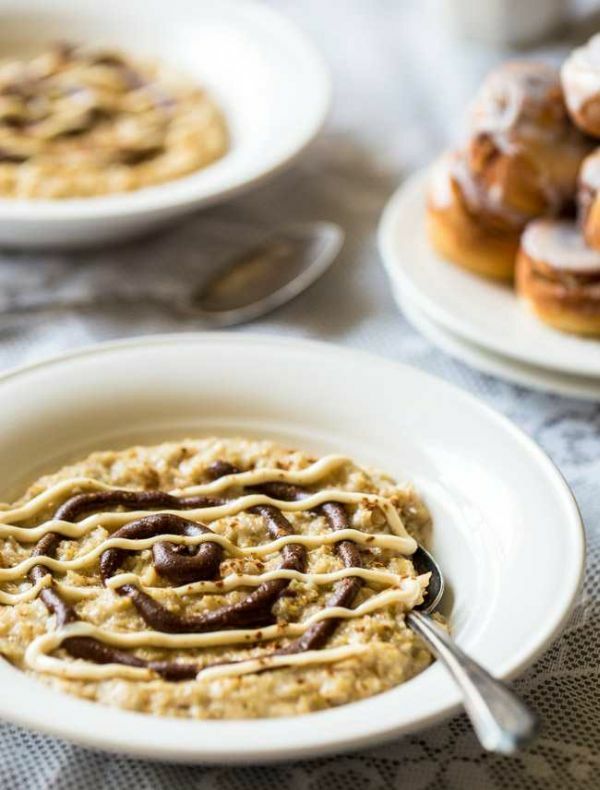 Put your Cinnabon craving back to bed with this healthy oatmeal that’s reminiscent of a cinnamon roll – complete with swirls of cream cheese icing on top. Not only is it way better for you than a greasy baked “good,” but it takes only five minutes to prepare. 1. In a small pot, combine the oatmeal and Truvia (or other sweetener). 2. Add in the water and 1/2 teaspoon of the vanilla extract, and bring the mixture to a boil over medium-high heat. 3. Once boiling reduce the heat to medium-low, and stirring frequently as it simmers until the oats are thick, about 5 minutes. Remove the oatmeal from the heat, and let cool for 5 minutes. 4. Meanwhile, stir together the protein powder, cinnamon, and coconut sugar in a small bowl. Add in the water, 1 teaspoon at a time, and stir to create a thick, but spreadable icing – like what you’d spread on top of a cinnamon bun. Set aside. 5. In a separate bowl, stir together the softened cream cheese and remaining 1/8 teaspoon of vanilla extract. Sweeten to taste. 6. Add the cinnamon mixture and the cream cheese mixture to the oatmeal, and swirl it around. Devour! There are countless variations on apple pie, including the pared down, deconstructed, and purely decadent. But it’s also possible to infuse oatmeal with all the flavor of an all-American apple pie, especially if you let it all simmer in a slow cooker to bake in the flavor. Any milk will do, but using almond milk adds a nutty element that’s reminiscent of rustic pie crust. 1. Add the oats, almond milk, diced apples, coconut oil, cinnamon, nutmeg, maple syrup, and lemon juice to the slow cooker. Stir all ingredients together. 2. Cook on low for 8 hours, or high for 4 hours. 3. 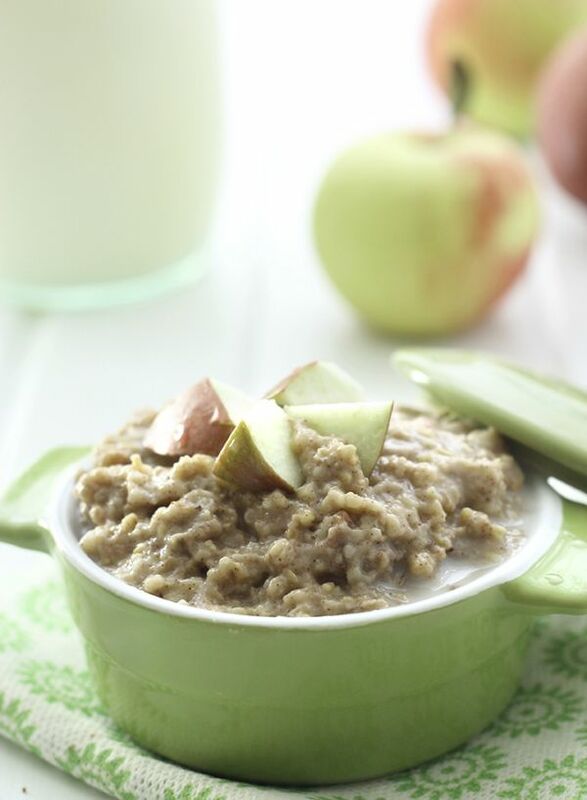 Give the apple pie oatmeal a good stir, and transfer to individual bowls. Pile on your favorite toppings, like peanut butter and crunchy apple pieces. 4. Store the leftovers in the fridge for up to a week. To reheat, add a splash of almond milk, and heat in the microwave or on the stove. If you think oatmeal has to be hot, try this recipe instead. The result is a unique yogurt parfait meets oat pudding. Mix in some dried and fresh fruit, seeds, roasted nuts, and spices, and you have one simple and irresistible treat. To get even greater nutritional benefit, add a little protein powder; combine with the milk and yogurt before assembling the parfait for best results. 1. Place oats, milk, yogurt, cranberries, apples, banana, vanilla, and cinnamon in a medium-sized bowl. Cover and let soak overnight in the refrigerator. 2. In the morning, add a splash or two of almond milk, and stir the mixture. Divide it into two bowls, and sprinkle almond or chia seeds on top. Drizzle with maple syrup, if desired. 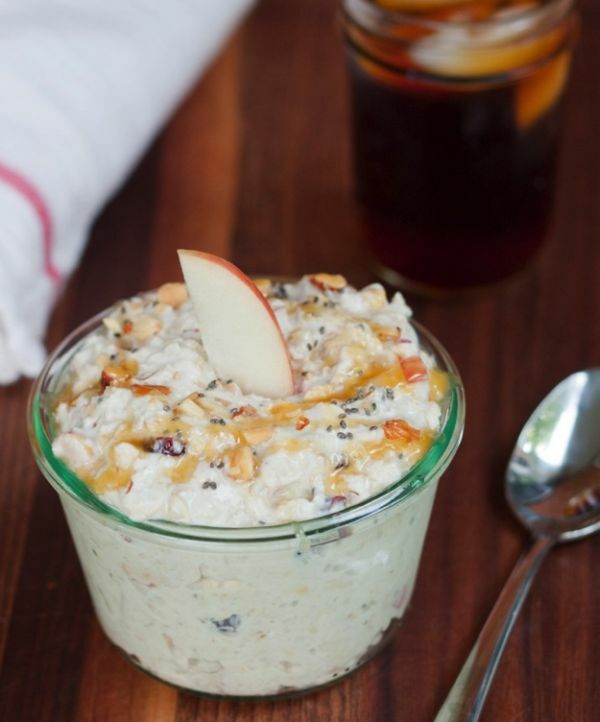 What did you think of these healthy oatmeal recipes? Have anything else to share? Let me know in the comments below! Muscle for Life Success: Ash R.